There is a new third-party heart rate monitoring app for the Apple Watch on the block, and it negates the need for firing up the stock Workout application. Developer Zach Simone created his HeartMonitor with a simple goal in mind - that it continuously tracks your heart rate within "sessions" you can initiate, and won't count towards your Exercise ring. 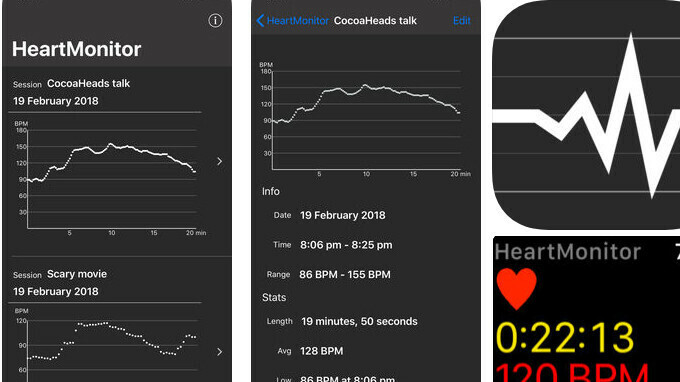 "HeartMonitor is useful for monitoring your heart rate in nervous situations, such as while giving a conference talk or presentation, in the dying moments of a football game, or while watching a horror movie." It's a funny app description, but a badly needed feature, as, up until now, Apple Watch owners had to start activity measuring within Workout, and it it went into their total levels, even if they only wanted to track the reaction to an isolated event. HeartMonitor not only shows your current and average beats throughout the session, but also logs those into the accompanying app for your iPhone. That's another long overdue option, making it easier to monitor and track your reactions to different types of events in the future. Word to the wise, though, the app does drain your Apple Watch battery, while it is continuously logging your heart rate during the next horror movie binge.